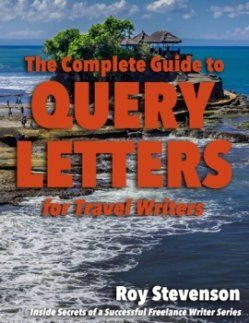 When it comes to writing successful query letters, I hear the same questions over and over from people just starting out in travel writing. As a freelance travel writer, you'll hear conflicting advice about queries. This article will set the record straight in terms of how I do things, what has been successful for me, and the advice I give to my coaching clients. Most "experts" still recommend a traditional approach to writing and sending queries to editors. 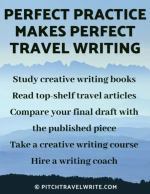 Following their advice is a mistake if you want to succeed at travel writing. With the digital age and the speed at which things happen these days, the game has changed and freelance travel writers who want to succeed need to change with it. This article is intended as a guide to answer the questions about query letters that I hear most often, and will help clarify the rather murky waters surrounding this critical topic. Put the juiciest things at the beginning of your letter, and then follow with the rest of the details. I always put the sexiest stuff in the first couple of sentences. Also, tighten the content and make sure it flows. Your query letter gives an editor an advance view of your writing abilities, so make sure it reads well and flows. The best way to make sure an editor reads your query is to write a good one. You’ll know you got her attention when you receive an acceptance, or you might also receive an encouraging rejection. Either way, you know she read it. On the other hand, there are several things that will definitely turn an editor away: typos, misspellings, and poor grammar. Any of these things are surefire ways to get your query letter deleted. You might think this is obvious - after all, we’re writers. We know how to write, right? Unfortunately, I have seen many queries with typos, misspellings, and poor grammar. Magazine editors will not respond to your letter if you make these kinds of mistakes. 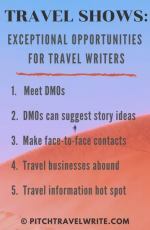 Editors won't spend their valuable time correcting poorly written manuscripts, and the universal expectation is that travel writers will already have these skills. Show the editor in your query letter that you have good writing skills. 1. Take a writing class or two at your local community college. 2. Always run your documents through the spelling and grammar check in your word processor to help improve the readability. It will delight you to see how many errors are found and easily fixed. How many magazines should I pitch? For the most successful query letters and the best response, I suggest sending queries to fifteen to twenty-five print magazines for each story. Sending out multiple queries (called simultaneous submissions) has been one of the cornerstones to my freelance success in getting published frequently. It’s extremely difficult to target an individual magazine and succeed in getting your story published in it. Only a few well-known and well-published travel writers in the world have this luxury. My approach is to target all magazines that are appropriate for a story and query them all. Should I customize my query for each publication? Despite what any of the experts tell you, it is not necessary to customize your query for every single magazine. Send the same generic query to them all. I rarely customize my queries and have done quite well anyway. 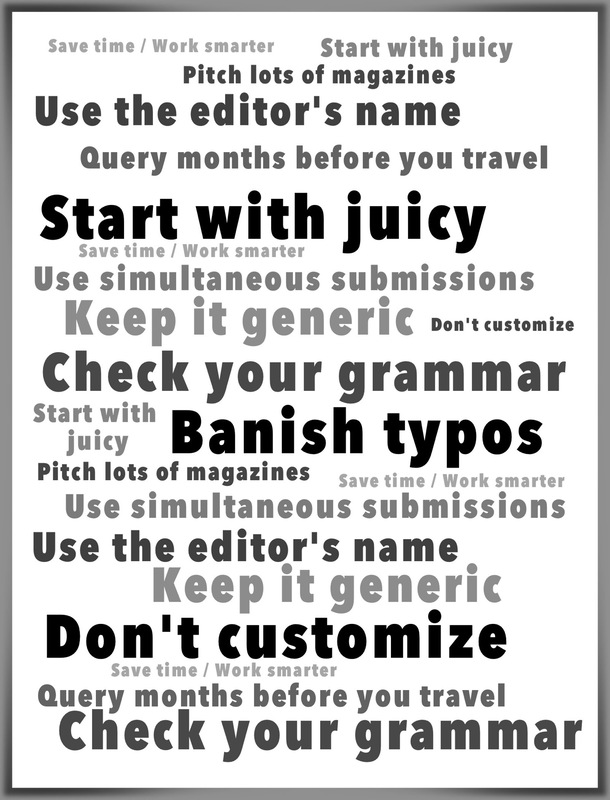 Briefly scan the writer’s guidelines for each magazine and tailor a couple sentences if you think it’s absolutely needed. However, there is one thing you absolutely need to customize with each query. Successful query letters always include the editor’s name. This is a requirement, no exceptions. Otherwise, keep it generic. Don’t make your job any harder than it already is. I know many freelance writers who tailor every single query to each publication. It takes a lot of time and doesn’t improve their acceptance rates. Don’t waste your valuable time customizing. I don’t customize and still manage to get 90% of my stories into print. Remember, a good story is a good story, and if it’s a good fit for the magazine and the timing is right, the editor will accept it. I also don't think you should suggest to the editor which section of their magazine this story will fit. The editor knows his magazine intimately. He’ll know the best place for your story and will place it accordingly. I know these marketing techniques defy the traditional 'rules', but as a freelancer it's time you set your own rules. Things have changed in freelance writing in the past several years. Sending out multiple queries works well for me, and I don't see why it shouldn't work for you. 2. Address each letter/email to the correct editor of each magazine. 3. Don’t customize the body content. Why should I send out so many simultaneous submissions? As mentioned earlier, my approach is to target all magazines that are appropriate for a story and query them all. The result is that usually one or two editors are interested in buying the article. Using simultaneous submissions works, and I talk about it in more detail in a separate article. The days when you could selectively target one or two magazines with your queries are long gone. Successful query letters include an extensive magazine list to pitch. With simultaneous submissions you’re taking more of a shotgun approach, and then seeing where the cards fall. It saves you time and is more likely to result in getting published more quickly and more frequently. Should I tell the editors this is a simultaneous submission? 2. It's not the editor's business. All successful freelance writers do it these days, and editors know this. There’s no point in mentioning it. In the rare event that more than one magazine expresses interest in your story, there are plenty of ways of handling the situation ethically and successfully - and even coming out of it with more than one assignment. It's happened to me several times and has never been a problem. How far in advance should I send out my query letters before I travel? A typical beginning travel writer’s mistake is sending out queries too close to their travel date. For example, starting the query process only two weeks before your Caribbean cruise doesn’t give editors enough time to respond. As a writer, it you won’t get any takers on such short notice. Pitch magazines and travel websites several months before you travel. Editors can take weeks or even months to reply to queries, if they even bother replying at all. And if they don’t reply, it gives you time to send out more queries. 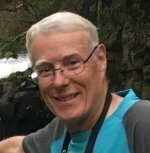 My general guideline for successful query letters is to send them at least six months before traveling to national and international destinations, and at least three to four months before traveling to local or regional destinations.